Reservations can be made for either of the RV parks at White Bluff by calling the White Bluff Property Owners office at 254-694-9276, 8:00 a.m. to 5:00 p.m., Monday through Friday. Be sure to review the RV Park Rules before making your reservation. Last minute reservations can be made at the front Security gate, based on availability. Bear Creek RV Park has 28 sites with electrical and water hook-ups. The outside ring of sites offers 50 amps service, the inside ring of sites offers 30 amp service. The park does not have sewer connections at each site; however, a dump station is provided. There are also 4 tent pads. 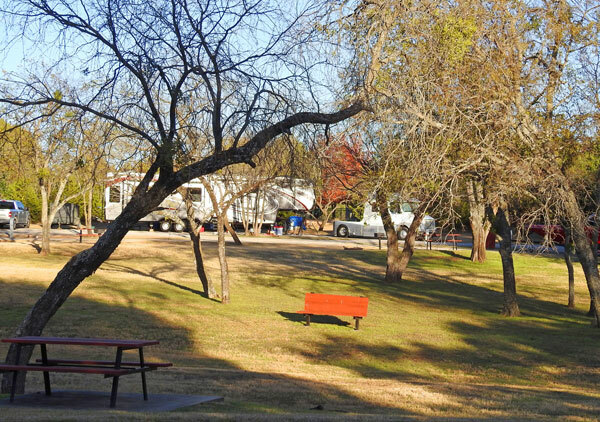 Quail Run RV Park has 20 sites with full hook-ups - water, sewer and electrical at all sites. Some sites have 50 amp service and some have 30 amp service. Bear Creek RV Park has electrical (30 & 50 amp) and water hook-ups but does not have sewer connections at each site. However, a dump station is provided. 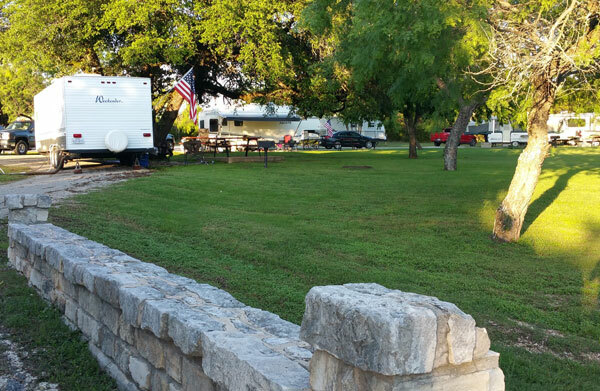 Quail Run RV Park has full hook-ups, water, sewer and electrical (30 & 50 amp) at all sites. Camping at both parks is on a first come, first served basis. Reservations are accepted for Major Holiday weekends, Memorial Day Weekend, July 4th Weekend, and Labor Day Weekend and may be made up to ninety (90) days in advance of the holiday. No guests are allowed space on Major Holiday weekends. Property Owners and Guests are charged $20.00 per night. Reservations are accepted for Major Holiday weekends. Fees must be paid in full at the time the reservation is made. Camping fees may be paid by cash, check, or credit card. Reservations can be made by calling the White Bluff Property Owners office at 254-694-9276, 8:00 a.m. to 5:00 p.m., Monday through Friday. If given proper notice refunds will be authorized on canceled reservations. An advance paid reservation fee guarantees you will have a space in an RV park, but not a particular camping site in the park. The following camping rules and regulations have been adopted and will be enforced by the White Bluff Property Owners Association (POA) in order that the Property Owners may obtain maximum enjoyment of the Resort and all camping facilities while maintaining a safe and healthy atmosphere. Camping will be permitted only in designated camping facilities. Identifications must be carried with you and your property owner card presented when requested. Payment of maintenances fees must be current. Property owners who are not current may not use the facilities. Only factory built recreational vehicles, campers and tents may be used. Converted buses, trailers, dilapidated RV’s or campers will not be permitted. It is recommended, due to no sewer connections at Bear Creek, that self-contained RV’s camp in that park. Portable generators used in camp grounds must have factory built installed muffler systems and spark arresters. Camping spaces in both parks are available by reservations or on an availability of first come, first served basis to all property owners and accompanied guests. Campers must occupy their unit each night or they will be asked to move. Guests will not be permitted to make reservations without the property owner. Reservations may not be made for guest campsites on holiday weekends, Memorial Day, July 4th and Labor Day. No more than one (1) guest/family per campsite and not more than one (1) guest/family per property owner will be allowed to use a space, subject to availability. If spaces become limited then the guest would be required to forfeit the space and make it available to a property owner. This will be determined by last guest in, first guest to leave. Reservations may be made up to ninety (90) days in advance. Occupancy of all campsites will be coordinated and/or determined by White Bluff Security during property owner check-in. Residents are not required to accompany their guests at campsites; however, property owners must be on property the entire time that they have guests in the campground. The maximum length of stay is fourteen days subject to space availability and within a sixty day period. A property owner may request extended time in excess of the fourteen day limitation to facilitate constructions of a site built home within White Bluff. Prior written approval of the Architectural Control Committee (ACC) must be obtained for any extension beyond the fourteen day limitation. All property owners and guests will be registered by White Bluff Security at time of arrival. Check-in time is 3:00 p.m. or after. Check-out time is 2:00 p.m. Extension for the purpose of site built homes shall be limited to only five units at any one time. All campsites must be kept clear of debris and clean at all times. All trash must be deposited in the receptacles provided in the camping areas. Please do not park vehicles on the grassy areas. Fires will be permitted only in the grills or fire rings provided in the camping area. No fires are permitted when a “burn-ban” is in effect. Violators of this rule are subject to fines imposed by the Hill County Sheriff’s department. Firewood must be provided by the property owner. Cutting or gathering of firewood on other property owners lots is prohibited. Amenities, pools, tennis courts, parks, etc. will be available for use during posted hours only. Property owners and accompanied guests must, at all times, observe the posted rules and use caution to not damage the facilities of the resort. Property owners and guests must conduct themselves in a responsible manner at all times. Disregard for the provisions of these rules and regulations or the restrictive covenants will result in revocation of camping privileges of the property owner and guests. Property owners are responsible for the actions of their guests. Quiet time shall be observed between the hours of 10:00 p.m. to 6:00 a.m. When pets are outdoors they must be on a leash. No pet shall be allowed to roam. All pets while on property must have ID on and be current on all state required shots. Discharge of gray water is prohibited. A dump station is provided for use at Bear Creek. All non-self contained campers must have a portable holding tank. Four (4) specially designed tent pads are available in Bear Creek. These pads may be reserved the same as any other site. All other Rules, Regulations and Fees apply as stated in previous paragraphs.